Piero della Francesca, known in his day as Piero di Benedetto de’ Franceschi, was born in about 1412 in Borgo San Sepolcro, as Sansepolcro was then called, into a merchant family that traded in leather and wool. As the first son of his family, he was expected to follow in his father’s footsteps. Typically for a merchant's son, he was sent to “an arithmetic primer teacher” where he learnt to calculate weights and measures, assess the volumes of barrels and bales, and keep accounts. From these humble beginnings, Piero went on to become the leading reviver and elucidator of Euclid and other Greek mathematicians, and soon after his death he was better known as a mathematician than as a painter. His artistic gifts enabled him to produce precise and conceptually sophisticated drawings to illustrate Greek and his own texts. He was participated in the intellectual and artistic life of all the principal surrounding courts, Ferrara, Rimini and Urbino, as well as the papal court at Rome. Piero's apprenticeship in painting (it was rightly regarded as a trade) took place in Sansepolcro, where he was trained by Antonio di Anghiari, the only artist working there at the time. A document bearing the names of Antonio and Piero della Francesca and dated 21 Oct 1436 acknowledges payment for papal coats of arms and flags for the doors and towers of Borgo San Sepolcro. Piero's first documented collaboration with an artist outside Sansepolcro was with Domenico Veneziano on a cycle of frescoes in the Main Chapel of the Church of Sant’Egidio in Florence in 1439. Domenico, as his name indicates, was of Venetian origin and few of his paintings have survived. He was a pioneer in the field of perspective, but it was his pastel palette of blues, pinks and greens, and his unusual interest in the subtleties of light, that had the more lasting influence on Piero. Piero had already worked with Domenico Veneziano as his pupil, very likely in Perugia in 1438, when Veneziano was engaged in painting “a room in the Baglioni’s house”, according to Vasari. Both Domenico and Piero were fascinated by Netherlandish painting, which was also becoming sought-after in the courts Piero was to frequent. Piero manifested a determination to master the use of oil painting, a technique he may have learned directly from a Netherlandish artist, possibly in Ferrara. But in his easel paintings he never switched definitively to oil, more frequently using a mixture of tempera and oil as binders. At the time of Piero’s stay in Florence, he had the opportunity to meet the most important artists of the time. In addition, a series of grand councils was being held in Florence, drawing together the Christian West and East to discuss the Holy Trinity. Representatives of the Greek world paraded through the town in costumes and colours which seem to have made a lasting impression on Piero. He not only had the opportunity to see for himself the exotic dress and headgear of the Eastern delegation, but also that of the Eastern Emperor himself. Byzantine apparel regularly appeared thereafter in Piero's works, prominently in the "Legend of the True Cross" and his celebrated "Flagellation" in Urbino. Piero also met Pope Eugene IV and the humanists of his Court, among them Leon Battista Alberti. In 1442, Piero returned to Sansepolcro and stood for civic magistracy offices. In the meantime, his town passed under the rule of Florence, having been surrendered by Pope Eugene IV in 1441, who was highly indebted due to the Council’s expenses. In 1445, Piero was commissioned to paint the Polyptych of Mercy. From those years onwards, Piero's life centred on Sansepolcro, Arezzo and the most important Courts between the Adriatic Coast and Umbria. After staying in Pesaro and Ancona, to which he returned in 1450 to paint the frescoes in Cappella Ferretti in San Francesco, he went to Loreto (as documented by Vasari), where he was commissioned to paint a fresco for the sacristy of the Church of Santa Maria. However, Piero fled the plague-ravaged region between 1447 and 1452, leaving his work unfinished. Vasari reports that Piero also created other works in San Ciriaco (Ancona). Piero thus stayed in Marche on several occasions, independently of his commitments in Urbino. This accounts for his profound impact on the area’s local painting. Piero then moved to Ferrara where he found a stimulating environment at the Court which was a model of humanist culture. He met the humanist Guarino da Verona and was allowed to study the gems and coins collected by Duke Lionello At that time there was a painting by Rogier Van der Weyden in Ferrara. This allowed Piero to observe the great Flemish artist’s eye for detail and his command of oil painting. 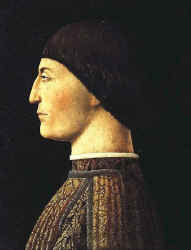 In 1451, Piero left Ferrara for Rimini, which was under the rule of the Malatesta and where he was commissioned to paint the votive fresco of Sigismondo Pandolfo Malatesta in Tempio Malatestiano. In Rimini, Piero took part in the humanist restoration of the Tempio conceived by Leon Battista Alberti, who, besides leaving important architectural masterpieces in Florence, deeply affected the Courts of Mantua and Urbino. Shortly after completing the fresco in Rimini, he worked on the cycle The Legend of the True Cross in San Francesco in Arezzo, which was started after 1452. In 1455, Piero was in Rome, painting frescoes in the Vatican for Nicholas V and continued to work in the Vatican Palace also under Pius II. Unfortunately, these paintings were destroyed to leave room for paintings by Raphael. In Rome, Piero met Francesco del Borgo, an architect and expert in mathematical studies, who was also in charge of modernising the Basilica of Santa Maria Maggiore, where Piero’s decoration of the vault of the Chapel of San Michele can still be seen. In Rome, Piero was prompted to study perspective, and copied and illustrated Archimedes’ treaty on the spiral, and also began drafting his treaty de Prospectiva Pingendi. Quite probably, Piero had already been to Rome for the Jubilee in 1450, given the Roman influences that can be detected in his paintings of the early 1450s (Baptism of Christ and the first phase of the cycle of San Francesco in Arezzo). In 1467, Piero was in Sansepolcro where he held new public offices. He was commissioned to paint a Resurrection which is now one of his most famous works. This fresco was painted in the Meeting Hall of Palazzo dei Conservatori di Sansepolcro (the current Civic Museum), probably in 1467-68. It is likely that Piero painted his striking image of the risen Christ stepping resolutely, banner in hand, from the tomb, to represent not only the resurrection of Jesus but also the resurgence of Sansepolcro. After a few years under the rule of Florence from 1441, Sansepolcro regained its identity and dignity in 1456 when the Florentines returned the use of the Palazzo to the Conservatori. The church Council the young Piero had witnessed in Florence had thus had unforeseen consequences for Sansepolcro. The Pope, his treasury depleted by his lavish Council, defrayed some of the costs by ceding Sansepolcro to Florence which later returned to it some measure of independence. 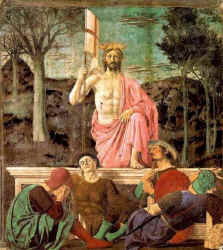 In 1469, Piero della Francesca was in Urbino at the court of Federico da Montefeltro, where he was entrusted with completing an altar table for the Corpus Domini Confraternity, for which Paolo Uccello had painted the dais. He returned to Urbino for the period 1474-1478. At this increasingly Dutch court, Piero was able to strike a unique balance between his sense of form and the new influences of the time. His two portraits of the Dukes of Montelfetro are among the most renowned works of the time, the synthesis of different trends combined in a unique painting technique. The Altar-piece of Brera and the Virgin Mary of Senigallia date back to the time he spent in Urbino. In 1478, Piero went back to Sansepolcro, where he received payment by the Brotherhood of Mercy for a Virgin Mary frescoed on a wall between their church and the hospital. He stayed in Sansepolcro until 1482, holding important and prestigious public offices and was quite wealthy at that time. In his last years, Piero gradually withdrew from public life, concentrating on the final draft of his treaty on regular solids, which he completed in 1485. He then codified the rules of perspective and mathematics as a guide for future artists, and wrote two fundamental works: De Prospectiva Pingendi (dedicated, quite probably, to Duke Federico da Montefelto) and Libellus de quinque corporibus regularibus, recently retrieved from the Urbino code 263 of the Vatican Library. He stopped painting, possibly due to poor eyesight for he eventually turned blind, but it could also be that his enthusiasm for mathematics surpassed his interest in painting. In 1487, he still managed to write his own will in his wonderfully clear hand. Piero della Francesca died on 12th October 1492, the day on which Columbus discovered the New World. Piero della Francesca is now recognised as one of the great artists of the early Renaissance and yet by the time of his death in 1492 he was better known as a mathematician and geometer than as an artist. A great many of his frescoes were torn down to make way for more modern work. As early as the 1520's, Pope Julius II called for the removal of his frescoes at the Vatican to make way for new frescoes by Raphael. Frescoes by Piero della Francesca have also been lost in Perugia, Florence, Ferrara, Ancona, Loreto and Pesaro. 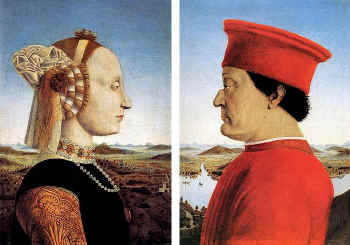 Arezzo holds the only complete Piero della Francesca cycle to survive. This is the "Legend of the True Cross" in the Church of San Francesco. The narrative is a pictorial history of the world from the Garden of Eden, through the birth of Christ and the crucifixion, to the victory of Constantine over the pagans and the rediscovery of the True Cross. Careful cleaning also brought to light, in the "Dream of Constantine" scene, the first known starry night sky in Western painting with scientifically accurate renderings of constellations. Sansepolcro © ammonet Web Site Promotion 2007 - 2018. All rights reserved.